The Colin Sapsford years 1936-1980, Christchurch Saint Laurence, Sydney, Australia. Geburtstagsgruss, op.145 : birthday greeting / Eric Gross. Earth spirit : Australian composers. 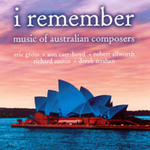 I remember : music of Australian composers. 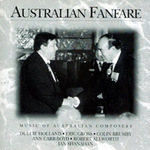 Fading light : music of the Australian composers. Unknown date: St Michael's Church, Vaucluse, Sydney. Featuring Lawrence Bartlett.